Thread: TelexFree is scam or not ? Re: TelexFree is scam or not ? lmao. People are asking for facts about what happened to their money, not 'opinions' on what you did with it. can't believe he's not taking credit for shutting it down. lmao. I guess fhtm really wasn't that bad according to this letter. Last edited by EagleOne; 04-22-2014 at 01:14 AM. 19. Randy N. Crosby, age 51, lives in Alpharetta, Georgia. He is one of the most successful promoters of TelexFree and has appeared in TelexFree promotional videos that have been posted on the internet. He has also promoted TelexFree through a website called "everybodygetspaidweekly.biz"
The Montana Commissioner of Securities and Insurance has issued a temporary Cease and Desist order against Telexfree. I've been following the coverage over on behindmlm. I've seen a few posts complimenting Oz on his reporting because of the latest developments. Behindmlm's first article on this ponzi posted July 2012. What did they think of him then? Did they think he was just a scam site bashing supposed genuine business opportunities and trying to stop people from making money? How many readers read the review and joined anyway, lost money, and are now posting comments and asking for help to get their money back? That reminded me of a quote from Cosmic Connie the other day, who has an awesome blog of her own. "I write all of this knowing full well that in the end, no matter how much I jab at Joe, make sport of Mocktor Loony, or kick at Katie, the lure of those sweet little lies will continue to win more hearts and wallets than a snarky little hobby blog ever could. But if you think that knowing this is going to stop me, you have seriously misunderestimated me." A sign of what’s to come on May 2nd? Following a hearing on April 25th and despite responses being filed in protest by both Randy Crosby and Santiago De La Rosa, on the 30th of April the Massachusetts District Court granted a preliminary injunction against the two. I have some poorly organized information about potential organizers for TelexFree. BWFC PROCESSING CENTER, LLC is registered agent for 1,276 Nevada entities, too much to check. The group of people is also operating as agents in other jurisdictions. Little is known about Paul T. Adams, the name is too generic to give reliable results when searching the internet. He's the resigned agent for several revoked / permanently revoked / dissolved / default companies in Nevada, around 2005-2007. Little is known about John D. Ewing, other than his "public profile" as manager for BRIDGEWAY FINANCIAL CORPORATION reg. 2005-02-14. Joe H. Craft was TelexFree's CFO until he resigned after the TRO in Massachusetts, when he was caught with $38 million in Cashier's Checks when TelexFree's office in Massachusetts was raided by Homeland Security April 16 2014. A: Nevada companies where BWFC PROCESSING CENTER, LLC is the registered agent. B: Nevada companies where Paul T. Adams was registered agent / had a position. The lists are simply copied from Nevada Entity search, Nevada Agent search and similar search methods. It's a method used when you don't know exactly what you're looking for, when you try to identify what to look for and how to find it. 1. I was initially trying to identify Joe Craft's role in TelexFree. 2. BWFC PROCESSING CENTER, LLC popped up as one of the companies. 6. Then it was time to stop, before derailing further from what I initially was looking for. I found a group of 3 organizers rather than 1. I found assets protection strategies, e.g. a chains of companies to hide the real owners. I found indicators of multiple scams, e.g. immigration investor scams (EB5 scams). This introduction was needed to understand some of the details I will post. This thread should be closed by now. TelexFree is 100% proven Ponzi, closed already and it's owners and managers getting sentenced to years in jail. Next - Wings Network. Still a lot of pimps moved to other things, more will be charged, trials, sentences, money recovery, the book is not finished. The wife of TelexFree Inc. co-owner Carlos Wanzeler was arrested at JFK International Airport Wednesday night as she tried to board a flight to leave the country, according to the US Attorney’s office. Katia Wanzeler was arrested on a material witness warrant, said the US Attorney’s spokeswoman, Christina Sterling. Federal prosecutors are investigating a billion-dollar global fraud that TelexFree was allegedly running. Carlos Wanzeler recently fled the US for Brazil. His business partner, James Merrill, was arrested last week and is in custody pending a hearing this Friday. On the April day when federal agents raided TelexFree Inc.’s office in Marlborough, co-owner Carlos Wanzeler hopped into a BMW with his daughter and drove north, slipping into Canada through the tiny town of Lacolle about 11 p.m. Two days later, they caught a flight to Sao Paulo. Wanzeler’s wife, Katia, was not so lucky. On Wednesday night, federal agents arrested her at JFK International Airport in New York as she was steps away from boarding a plane bound for Brazil, to join her husband. The details of Carlos Wanzeler’s departure are part of a court document released Thursday, shedding new light on the moves of TelexFree’s owners in the days before they were accused of running a billion-dollar global fraud. Technically, no. The two are being sought, but they haven't been judged yet. The other 6 haven't been arrested. "From April 2012 to April 2014, TelexFree and its two owners Merrill and Wanzeler, assisted by company insiders Labiriola and Craft and promoters such as Rodrigues, De La Rosa, Crosby and Sloan, raised more than $340 million from hundreds of thousands of investors worldwide, including many members of the Brazilian and Dominican immigrant communities in Massachusetts, through a fraudulent and. unregistered offering of securities." " The membership tees from investors constituted 99% of the monies taken in by TelexFree"
" Based on the information available to date, TelexFree's revenues from retail VoIP sales —about $1.3 million in two years —were barely 0.1% of the amount needed to honor its promises to investors who placed internet ads — nearly 51.1 billion. As a result, in classic fashion, TelexFree paid its earlier investors, not with revenues from selling the VoIP service, but with money received from later investors." " The company's financial records indicate that, from mid-November 2013 through mid-April 2014, TelexFree transferred approximately $33 million to the individual defendants, their Family members, and companies they controlled (including the relief defendants)"
Internet ads (one per day for each AdCentral contract and five per day for each. AdCentral family contact)"
" investors were promised unusually high returns —over 200% per year —for doing virtually nothing (except posting meaningless Internet ads); (2) investors were promised bonuses if they recruited new investors, who would do virtually nothing except post ads and recruit new investors (arid so on and so on); and (3) there was an actual VoIP service, but investors did not have to sell the service in order to get paid. 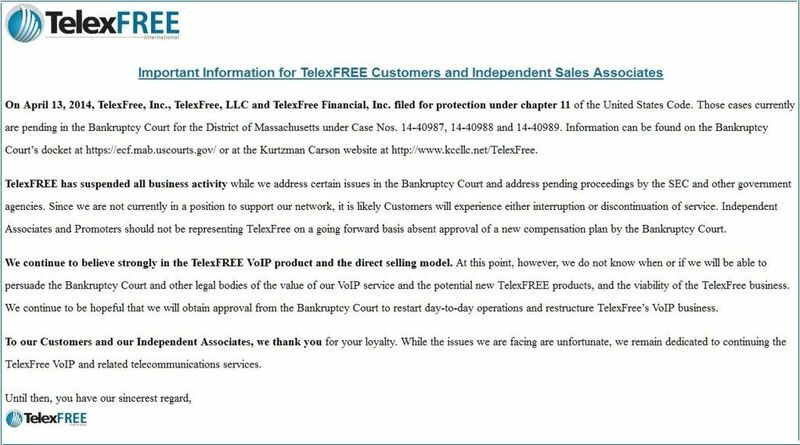 Because investors were strongly encouraged to recruit new investors and were not required to sell the VoIP service, the almost inescapable inference is that TelexFree was using funds from later investors to pay earlier investors"
"Credit card and banking transactions indicate that, from August 2012 to March 2014, Telexfree received slightly more than $1.3 million from the retail sale of approximately 26.300 monthly VoIP contracts. During the same period, TelexFree received more than $340 million from hundreds of thousands of investors who purchased AdCentral or AdCentral Family contracts"
" In other words, the revenues from retail VoIP sales covered barely 0.1 % of TelexFree's obligations to pay AdCentral investors who placed ads"
Gateway, i-Payout, and Allied Wallet — likewise terminated their relationships with TelexFree"
"As a result," Sloan knew, was reckless in not knowing, or was negligent about the fact that her public statements promoting TelexFree, including those quoted in the previous paragraphs, were materially false and misleading and, more generally, that her promotional activities on behalf of TelexFree were fraudulent and deceptive, because TelexFree was a Ponzi and pyramid scheme that was destined to collapse, thereby preventing it from making the payments promised to investors"
"The information available to date indicates that Merrill and Wanzeler, who had sole authority to transfer TelexFree corporate friends until the bankruptcy filing, caused more than $33 million to be transferred from TelexFree accounts to themselves, to family members, to the other individual defendants, or to companies under their control (including the relief defendants)"
The information available to date indicates that, between September 2012 and December 2013, Merrill received more than $3.2 million from TelexFree. a. On December 27, 2013, TelexFree paid $3 million to an account jointly held by Merrill and his wife. b. On December 26, 2013, TelexFree paid $136,200 to Merrill. c. Between September 2012 and February 2013, TelexFree paid a total of $85,000 to Merrill, primarily in monthly payments of $7,500"
Tne information available to date indicates that, between November 2012 and February 2014, Wanzeler and members of his family received almost $13.7 million from TelexFree. c. On December 26 and 27, 201.3, Wanzeler received. a total of $7,317,800. d. Between November 2012 and April 2013, Fabio Wenlzeler, the defendant's brother, received more than $53,000. e. In addition, on April 1 1, 2014 —two days before the bankruptcy filings — Katia Wanzeler and Merrill visited a bank where TelexFree, LLC had an account and obtained cashier's checks for more than $25 million. One check in the amount of $2,000,634, was payable to Katia Wanzeler. That cashier's check is one of the items seized by federal agents at TelexFree's office on April 15, 2014. Wanzeler transferred a significant portion of the money he received from TelexFree to at least one bank outside the United States. a. On November 25, 2013, he sent $50,000 to an account at the Oversea-Chinese Banking Corporation in Singapore. Wanzeler used investor funds to build a small real estate empire"
113. The information available to date indicates that Labriola received approximately $8500from TelexFree in 2013 and approximately $46,600 from Wanzeler's company Above & Beyond"
1.14. The information available to date indicates that, between September 2013 and March 2014, companies under Craft's control (including Craft Financial Solutions, Inc. and Craft Trust Services, LLC) received more than $2 million from Telexfree"
115. Tlie information available to date indicates that, between. September 2012 and March 2013, Rodrigues and companies under leis control received $317,220 from TelexFree. a. On February 28 and March 15, 2013, TelexFree paid a total of $231,367 to W WW Global Business Inc., a corporation that Rodrigues owns. c. On October 9, ?012, TelexFree paid $3,600 to VICSS, Inc., a corporation Rodrigues controls"
11$. De La Rosa used investor fiends to support his- lifestyle. a. He paid $501,000 in cash for a house in Lynn, Massachusetts. b. He made payments to a BMW dealership and a Mercedes Benz dealership"
promoting TelexFree in December 2012. Nevertheless, he paid $70,000 in cash for a Porsche in September 2013 and $99,000 in cash for another Porsche in December 2013." 120. The information available to date indicates that, between March 2013 and April 2014, Sloan. received snore than. $160,400 from TelexFree investors and $51,000 from TelexFree itself"
b. According to the financial. statements for 2013 prepared by Craft, TelexFree, LLC made a $2,022,329 "loan" to TelexElectric. TelexFree, LLC made a $500,870 "loan" to Telex Mobile"
122. The whereabouts and/or disposition of much of the more than $340 million. of investor funds raised by TelexFree is presently unkown"
Last edited by littleroundman; 05-28-2014 at 11:15 PM. JustTooMuchTime and NikSam like this. I am expecting these numbers to go up once the BK Trustee is named and the accounting begins internally. At least they will be able to see to what countries the money was sent to and how much. This is going to get very interesting and soon.